There is an unwritten rule in consumer public relations that, at some stage of your career, you will either float something down the Thames, unveil a giant thing at Potters Fields or send something into space; welcome to the club, Elon Musk. Yesterday, Elon and his SpaceX project took its latest step on a mission to Mars with the launch of the Falcon Heavy rocket. While physicists and accountants marvelled at the prospects for low-cost space travel, most of us were captivated by the images of the test payload. 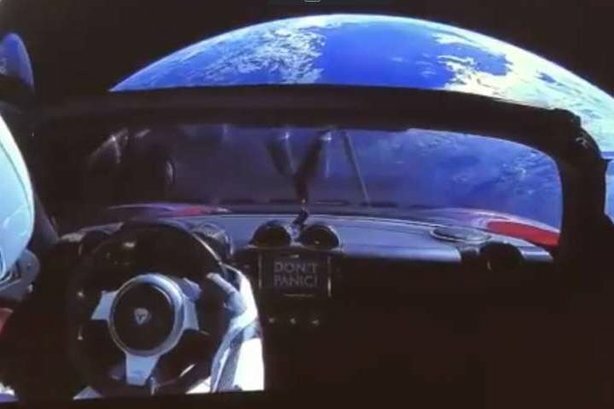 A Tesla Roadster ‘driven’ by a mannequin named Starman, playing David Bowie’s Space Oddity on continuous loop is now heading towards the sun and then on to orbit Mars. The video and still images of the Tesla above the earth are cinematic, majestic, mesmerising and moving. The judges at Cannes shouldn’t even bother convening this year, just give everything to Elon and SpaceX because it is one of the greatest, most visually stunning PR stunts of all time. They won’t, of course, because doing something absolutely awesome for the hell of it never quite cuts it unless there is ‘purpose’, a cause célèbre to elevate, and someone will sniffingly point out that ‘This is not a first’. The judges at Cannes shouldn’t even bother convening this year, just give everything to Elon and SpaceX because it is one of the greatest, most visually stunning PR stunts of all time. They won’t, of course, because doing something absolutely awesome for the hell of it never quite cuts it unless there is ‘purpose’, a cause célèbre to elevate, and someone will sniffingly point out that ‘This is not a first’. As noted, ‘sending something into space’ is nothing new in the world of PR. Let’s recall the space race among UK agencies in the late noughties. It was sparked sometime in 2008 when images of a teddy bear alone and smiling benignly on the edges of the Earth’s atmosphere achieved blanket media coverage. More remarkably, it was done as a primary school project using a weather balloon. Every PR with half their wits about them suddenly realised that they too could send random stuff into space (although technically the edge of space) and get amazing images by slipping a few grand to bewildered climatologists at Cambridge University. As long as the payload was small enough to be held in one hand, the world, quite literally, was yours. I must confess to being in on the act: getting in early with a disco ball for J&B whiskey (which, remarkably, made national TV news in Cyprus) for its ‘Start a Party Anywhere’ platform. In this period, we also saw an array of toy figures, foodstuffs and FMCG products flood picture desks – with mixed results. Soon it became a cliché and we all moved on (although a chippy in Hull repeated the feat last year and made national news by a sending a cod and chips into space). Compared to a chip supper it’s hard to see this SpaceX Tesla stunt ever being beaten for sheer visual spectacle. ‘Iconic’ is a word abused and misused by PR professionals, but these images are. The only drawback is that ‘marketing gurus’ are revising their opening PowerPoint slide with an image of the Tesla above the Earth and the caption ‘How far can you take your brand?’. There’s always a downside to everything.